The J B Central hotel is located in Merlin Tower at Jalan Meldrum. When you are at Merlin Tower, the main lobby which is small is at the side of the minor road of Merlin Tower building. Just next to this hotel is a coffee shop selling Indian food ( try the roti prata – indian pizza ) and an overhead bridge that leads to City Square Mall. If you are walking from the new CIQ in Johor Bahru, just cross the overhead bridge to leads to City Square Mall and then you can walked on the road or cross another overhead bridge again to Merlin Tower. As mentioned earlier, the main entrance of the hotel is small and there is no doorman or staff to greet you at the entrance. So do pick up your own luggage and head straight to the reception counter. The lobby looks old but it is clean and spacious enough. To check in, it is a breeze. Normally I would just check in as a walk in customer and there are rooms still available. However if there is no more rooms for that day, don’t panic – as there are many other small hotels near by. By the way, there is no swimming pool in this hotel. It is basically a 2or 3 star budget hotel – depending on how you want to rank it. If you are staying in the high floor, your room will have a paranomic view of the city of Johor Bahru. You can even see Singapore from your room’s windows. The room itself is spacious and clean. 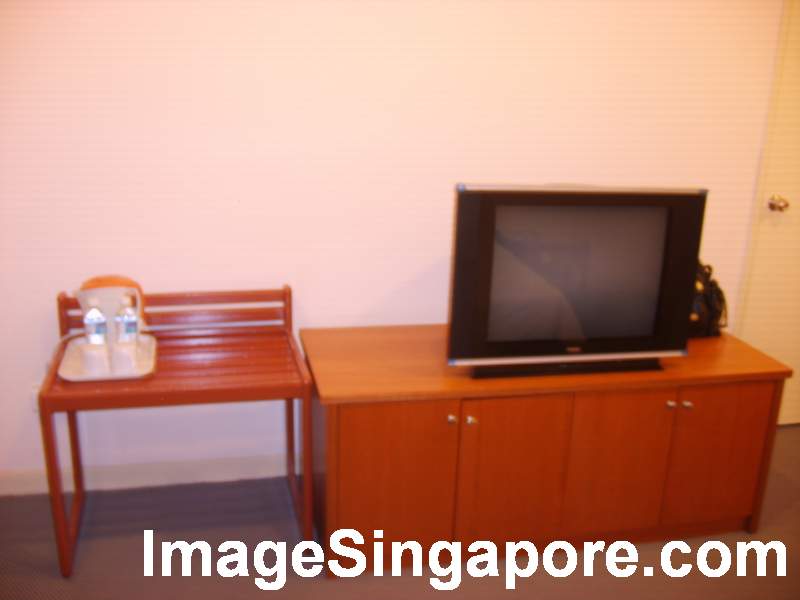 You have a good working airconditioned and a flat screen TV. The bed is firm and comfortable. There is a kettle for you to make hot beverages but unfortunately there is no mini fridge. No fridge means no cold drinks – so disappointing. If there is a improvement that this hotel can make is to provide a mini fridge for the customer. After all, I don’t think it will cost much and definitely travellers like me will greatly appreicate it. The bathroom is spacious and there is no bathtub. I don’t mind about not having a bathtub – a standing shower is good enough for me. However I do notice that the water pressure sometimes is quite low. This is a problem that the hotel should try to resolve. I am happy to see a long desk in the room. This is good for those who need to do some work or to read. Overall I am quite satisfied with the room except that they should really provide a mini fridge for storing cold drinks. There is a complimentary breakfast that is served on the small restaurant on the lower floor of this hotel. In my opinion, the breakfast spread is too basic and too little. The hotel management could look into serving a wider spread of food. An example to follow perhaps is the J A Residence hotel in Johor Bahru – both are budget hotels with almost similar rates. But J A Residence hotel clearly serve better breakfast. I like J B Central Hotel for its strategic location. From here, you can go almost anywhere in Johor Bahru city itself. I like it for its spacious clean room with its paranomic view of Johor city. There are improvements that this hotel can make that I have mentioned earlier; to provide a more pleasant stay for travelers.